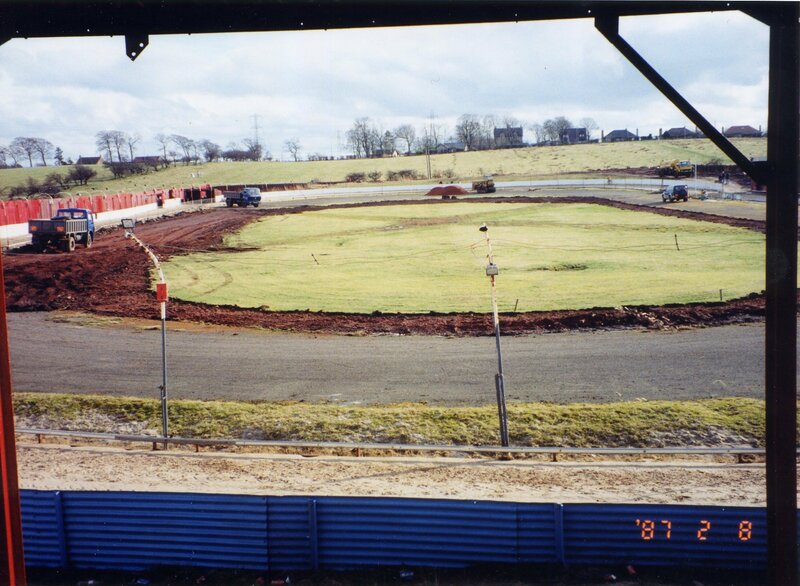 Monarchs raced at Shawfield in 1996 after being turfed out of Powderhall by its financial institution owner. The year in the west saw much good racing and much money lost, and the reason we were there was that our application to race at Armadale had been turned down by West Lothian Council. More in hope than expectation we appealed to the Scottish Office, while making plans for a possible move to Linlithgow for the new Premier League. In January 1997 we heard that our appeal over Armadale had been successful, and it was quickly decided that Armadale was our new home. There wasn't much time to have the track ready, in what was a greyhound and former stock car venue, but we made it through the hard work of everyone who helped. Here we see the track being cut out, with parts of the old stock car track remaining. The numbers in the corner may well be the date set 10 years too early, ie 8th February 1997.